Inventory We are a resale marketplace, not a box office or venue. Ticket prices may exceed face value. This site is not owned by Starplex Pavilion . The Starplex Pavilion formerly the Superpages.com Center and Gexa Energy Pavilion is one of the premier outdoor amphitheaters in the south to catch the summer concert series. Starplex Pavilion was opened in 1988 under the name Coca-Cola Starplex Amphitheatre. The venue was also known as the Smirnoff Center from 2000 to 2008. The Superpages.com Center box office can seat 7,533 people for any show and has accommodations for another 12,578 on the lawn. Popular Starplex Pavilion tickets have included Coldplay, Rush, Aerosmith, Tom Petty, Dave Matthews Band, Jonas Brothers, and Roger Waters. 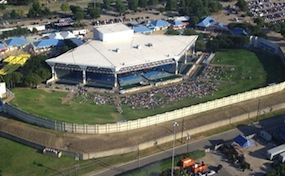 The Gexa Pavilion is part of the Fair Park complex that is owned and operated by the City of Dallas. Starplex.Paviliondallas.com is an independently owned and operated company that specializes in the online retail for all secondary market events. All tickets may be above or below face value and can change at anytime. We are not affiliated with any official box office, web site, or supplier. To purchase tickets for all Starplex Pavilion events simply click on the event of interest or call our operators at your convenience.